Nearly 2 weeks making Rugby Midland and my brain is getting a little fuddled. Not long after MSTS was released, I was into playing flight simulators, but on a trip to PC world to get another up-grade, I spotted MSTS. Bought it, ran it, and thought ...... not bad. A month later, I went on the crazy direction of how MSTS was actually built, delving into the route editor. No books, just the MSTS help files. (They're not bad actually). Six years of building routes for myself, working out all (maybe all ) of MSTS RE quirks, before I felt confident that I could build a route that equalled what was already there. Then it was research and the god-send (to me) of UKFS. No longer did I have to use those ridiculous over scale default tracks. Now 6 years later, I still scream at RE . I still haven't ran all of the default activities built for MSTS. Is this a record? Re: MSTS How Long ? I'm not sure if this is a record, but to work with RE for 6 years you have to be pretty determined. I know after 3 years on South East this will be my one and only route, and it's less than 100 miles - you mentioned 300 miles on another thread for your route extension - I really admire your staying power Clive. As for the original MSTS, I only ran two activities on Settle and Carlisle before giving up as I wasn't enjoying the experience. A few months later I stumbled upon LSE, ran all the activities even though I'm not into DMU's, and was hooked. I've been doing routes for about 10 years, not very prolific as I sometimes miss a few days at a time. I tend to do a bit leave a bit, but I get a buzz out of achieving a resonable interpretation of the section I'm building. I'm presently extending Burton Derby v2, to be Stoke Nottingham 1950s, thats the period I have track plans for and some gradient information. I have completed the trackwork on the Stoke section, and gone as far as Macclesfield, but theres plenty of scenery to complete. However Reg (refman) has recently completed the Bennerley Viaduct, so that has inspired me to complete the Derby Friargate to Nottingham Victoria section. The track is laid, but signalling is'nt completed yet, and of course theres lots of scenery to add, Reg has redone most of his trees which will be included. The next section to be laid will be north to Clay Cross and Chesterfield, both from Crich and Pye bridge, its four track from Pye bridge north, with a few junctions and sidings. I hope to extend a few miles east from Nottingham, both stations being linked, track plans for this area are a little sparse, but I have an atlas of station names to refer to. this illustrates it for those who may not have seen it. An article on bridges I was perusing was interesting with respect to Notingham and goes to prove that what goes around comes around. As we all know the GCR was the last mainline route to be built, and because of this large wrought iron bridges needed to be built to carry it over the existing Nottingham station. Despite closure in the 1960s, these bridges weren't demolished until circa 1983. Currently a new bridge is being built over the existing station, as part of the extension of the Nottingham Express Transit, on the same line as the GCR bridge! The method of construction is by incremental launching of two halves from both sides of the station, and the actual construction comprises what is known as a Warren Truss and this has a total weight of 1100t. 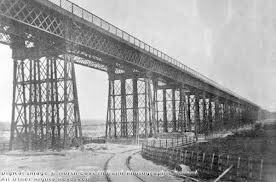 The GCR 'Birdcage' bridge at the southern approach to Rugby. bigant wrote: not very prolific as I sometimes miss a few days at a time. Trouble is I need sleep now and again, and it takes time. I've planted some trees, fences and built a bridge today, havent been able to do much due to an attack of sciatic. 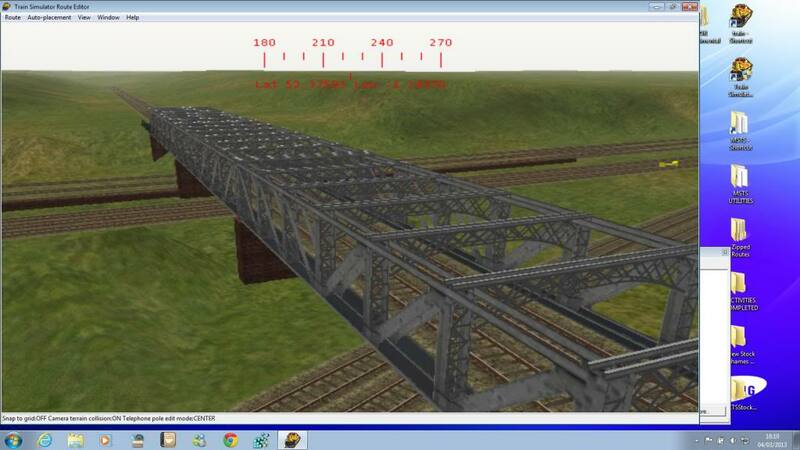 Very nice model of the bridge Clive. I also like that bridge. Personally I find work gets in the way, and I can never quite escape SWMBO's list!